Want to get some Ice Cream Sandwich for under $50? 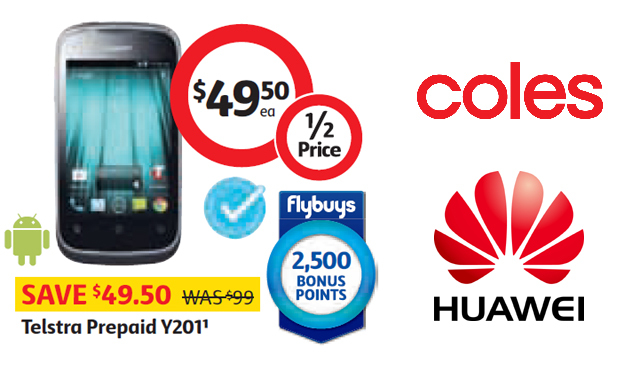 Well from tomorrow Coles(and Bi-Lo) will be offering the Huawei Ascend Y201 which runs Ice Cream Sandwich for just $49.50 which is half the normal price of $99. The Y201 comes with Blue Tick Approval for improved access in regional areas but it is also locked to the Telstra network so you’ll need to unlock it if you want to use it on another network. The phone is available while stocks last from tomorrow(23/01) and no trade sales are allowed. There’s also a bonus of 2,500 bonus Fly Buys points if you’re into that sort of thing. It’s a pretty decent purchase for $49.50 especially with Ice Cream Sandwich on-board, I’m half tempted to get one to retire my Telstra Uno but it’s still doing the job although at $49.50 it really is tempting. Anyone else up for this? Why can’t businesses buy them???? Could someone please let me know if this cell phone and deal is still active at Coles? Thanks. $6 on Ebay to unlock. Takes 1 minute. This will be the title pic for the review!!! How do you unlock it from Telstra though? You have to contact Telstra, they generally require you to pay a fee or use a minimum amount of credit before they’ll unlock it. You could use Kogan, they are super cheap and use Telstra. Seems like a bargain. Reading user experiences most are positive. I’m thinking of picking one up for the gf, as the HTC Wildfire S has no storage space. For the price, it’s a great replacement. Geez that is a bit scary..